In the adult beetle stage (June – July), one method of control is to hand pick the beetles from your plants and drop them in a bucket of soapy water. Leave them in the soapy water until they are dead, then dispose of them. Another method is to use an insecticide that list the beetles on the label and follow the label directions. Yet another method of control for Japanese beetles is to use Japanese beetle traps. Traps are safer for children and pets, and they do a fantastic job of eradicating the problem naturally. 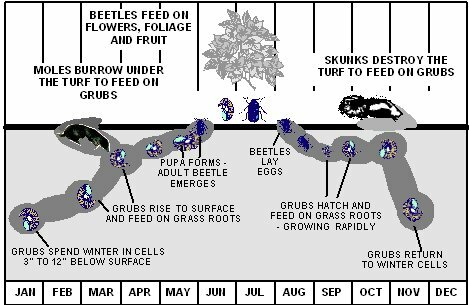 There are also ways to control these pests in the grub stage (August to September). One way is to apply grub control to the lawn in late summer. Some granular insecticides cover grubs as well as a wide range of lawn pests. You need to be sure that grubs are listed on the label. Some granular products target grubs specifically. These products often have grub as part of the name of the product. Follow label directions carefully on all insect control products. Another option would be to add Milky Spore, a good organic means of grub control, to the lawn. Apply according to directions, and the spore will naturally build in your lawn and protect it from grubs for up to 20 years.